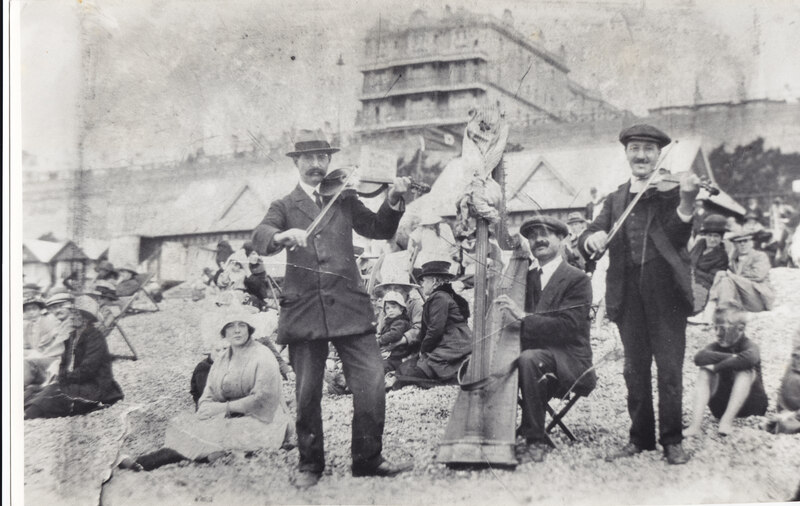 These were well known street musicians in Brighton, Carmine Amerena, Raffaele Alexander, and Joseppi Marcantonio. I think that this photograph was taken in the early 1900s. Has anyone any information on this group? From the private collection of the Amerena family. Put Frederick Alexander in the search box at the top of this page and you will have more on two of these performers, including family connections. Hi Richard, Thank you for a very interesting picture of a family that gave rise to a number of generations of Brighton musicians. I believe the names are incorrect and that they were Carmine Amerena, who was the oldest and born locally around 1874. The other two were brothers Raphaele (also spelt Raffaele) being the harpist and Giuseppe Marcantonio the violinist, both English-born sons of an Italian immigrant, Luigi Marcantonio. A whole enclave of different family members all lived in adjacent houses in Saunder’s Buildings around the turn of the century. Raffaele died in 1902 at the age of 21. When I was out of the RAF and living in Patcham with my parents, I played Double Bass with the Doug Boniface Band – I think it was “The Modernairs”. Doug was the drummer and played on a Pit kit – a very compact kit with all component parts mounted on an aluminium cast base (used by theatre pit musicians due to lack of space.) We played each New Year in The Royal Pavilion music room (the one that caught fire) and also in Hove Town Hall (the old one that burnt down!). I visited Brighton recently and found another venue where I played. This was The Snipe pub in Carden Avenue Patcham / Hollingbury Which I was surprised to find is now a Sainsburys small supermarket. It doesn’t pay to go back!